Dessert Capture the sweet and savory trend with these decadent cupcakes that look as good as they taste. For Maple Bacon Cupcakes: Preheat oven to 350º F. Line muffin tins with 24 paper or foil liners. In a separate bowl, cream butter. Add maple syrup and continue to beat. Add eggs, one at a time and beat, scraping down the sides of the bowl. Add flour mixture and beat until combined. Add milk and vanilla and beat until combined. Crumble half of the bacon and gently fold into the batter. Divide among lined muffin tins. Bake for 17 to 20 minutes until toothpick inserted into the center comes out clean. Cool in the pan for 5 to 10 minutes and transfer to a wire rack to cool completely before frosting. Maple Cream Cheese Frosting: Beat cream cheese and butter until light and fluffy. Add vanilla, maple extract and salt. Continue beating. Gradually add confectioners' sugar and beat until smooth and creamy. Spoon frosting into a pastry bag and pipe frosting onto each cooled cupcakes. 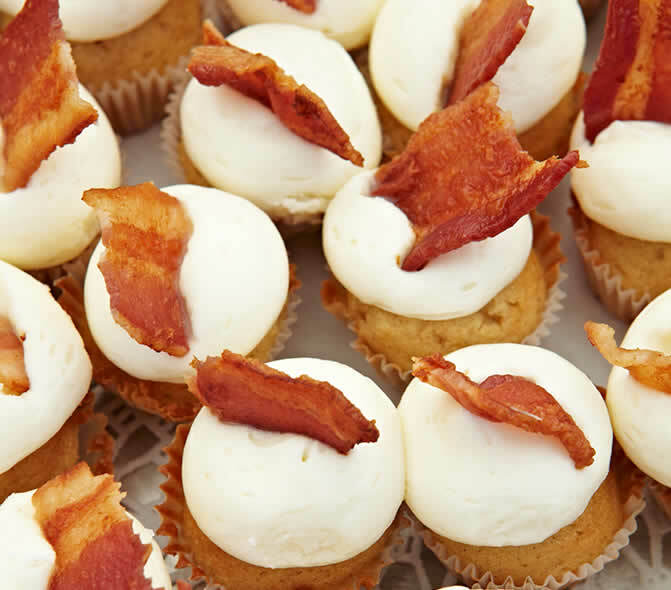 Chop or break the remaining bacon into 24 bite size pieces and garnish each cupcake with a piece of bacon.